Chances are you have come across many insects and pests during your time in Gilbert, Arizona. As well you have probably seen the same insects in or around you home growing up or being in others homes. While not all are harmful to you or your family, it is important to know which are harmful to your home. Here is some helpful information about common insect pests and whether or not they pose a threat to you and your family. The carpenter ant can cause major damage to your homes foundation because it tears through to wood to create many passageways. They may also live in trees so although you may not have a problem, having them around the house or yard is dangerous. Harvester ants create colony mounds around your yard. They will not get into the house however they have around 10,000 in their colony, and have stingers, so be careful around the mounds. Bed bugs are small parasite-like bugs that live within your mattress. They often feed at night on the blood of humans, usually every 5 to 10 days, although they can live for a year without even eating at all. Because of their size they are easily hidden throughout cracks or small crevices in your mattress. If you find any small dotting on your mattress call a professional immediately. The most common bees found in Gilbert are the African, European, bumble and carpenter bees. The African, European and bumblebee do not pose a threat to your home. They are not usually that aggressive unless provoked to do so. The carpenter bee may be a threat to your home. They are usually mistaken as bumblebees as they are larger and black. These are typically the make carpenter ants and do not have stingers unlike the females. They make their home in wood that is untreated or weather sealed. The most common cockroaches found in Gilbert are the Oriental (water bug), American and German cockroach. The Oriental cockroach can be found outside, usually are cohabiting with the American cockroach. The American cockroach does enter the house though, but can be easily killed with pest control. The German cockroach is the one to worry about. These cockroaches live within the kitchen and bathrooms, and are usually active at night. These are harder to get rid of and require extermination. To learn more about Gilbert’s common insect pests, stay tuned for part two. If you have any questions or concerns, please contact Varsity Termite and Pest Control for more information. If you need a Gilbert pest control exterminator, our professionals will gladly love to help you. 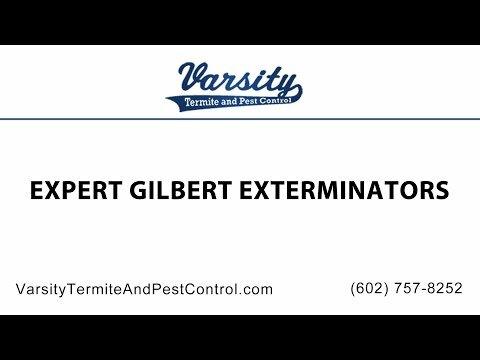 Varsity Termite and Pest Control also does services in Gilbert scorpion control and Gilbert termite control. Explore our website and blogs for more information and knowledge about pests.